Welcome to Uepi, a photo by DesParoz on Flickr. 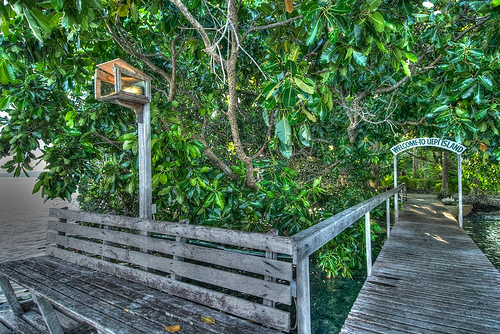 Getting to Uepi Island Resort is an adventure in itself - it is one of the most hidden away places you can imagine. First you must fly to Honiara, the capital of the Solomon Islands. Then a domestic flight to Seghe. Then a short walk through bush to the water’s edge where you board a "motorised canoe" for the 40 minute ride to the very edge of Marovo Lagoon where Uepi is situated. Marovo Lagoon is the world’s largest natural lagoon, and Uepi is on its very edge, near where it meets a deep ocean area called "The Slot". This is the Welcome Jetty at Uepi. Uepi is isolated, wonderful and spectacular. I think it would be my single favourite diving destination.